Do you wake up in the morning feeling sluggish? Don’t really fancy breakfast? Can’t face the day without a cup of coffee to get you going? This might be why…. There’s an old Chinese saying which goes “Eat your breakfast like a King, share your lunch with a friend, and give your dinner to your enemy.” You may have heard something similar involving princes and paupers. From the Chinese Medicine (TCM) viewpoint our Stomach and Spleen Qi (the life force of our digestive system) needs to be strong so we can effectively and efficiently nourish and fuel our bodies. Now, this digestive capacity is considered to be at high tide in the morning (7-9am) and at low tide in the evening (7-9pm). If we eat a big meal at night when this energy is low, the Stomach and Spleen are forced to work when really they just want to rest. Over time this can stress and weaken our Qi which would have a knock-on effect on our overall health and vitality. (The Stomach and Spleen Qi is seen as vital to life as they are primarily responsible for nourishing all organs and tissues of the body.) We wake up feeling heavy and sluggish in the morning because our bodies have been busy digesting food over night rather than focussing on repair and rejuvenation. On the other hand, eating a healthy breakfast in the morning will give us all the advantages of having strong digestive capacity on our side to assimilate and absorb the food properly, giving us the fuel we need throughout the day. As the proverb suggests, we would benefit most if breakfast were the main meal and the amount of food we consume would decline in volume through out the day. Now I agree this isn’t necessarily easy to do, but it’s worth considering choosing to have a lighter meal at night, eating earlier in the evening (before 7pm) or even skipping dinner entirely once in a while and seeing how you feel. By not eating for a period of 12-16 hours overnight you would receive the health benefits that are said to come from intermittent fasting. A balanced breakfast will kick-start your metabolism after you’ve been “fasting” all night. Eating a healthy breakfast prevents blood sugar imbalances, helps reduce hunger generally and makes it more likely that you’ll make better food choices throughout the day. Not only this but Deepak Chopra reviewed a study of people who lived to 100 to identify any common life-habits or attitudes that may help us lead a long life. Although a particular diet was not found; all the centenarians identified themselves as regular breakfast eaters. 1. Eat Real Food. Just throw away the processed stuff. 2. Include protein. Protein is the key to supporting lean tissue growth and metabolism, improving satiety and helping to regulate blood sugar. 3. 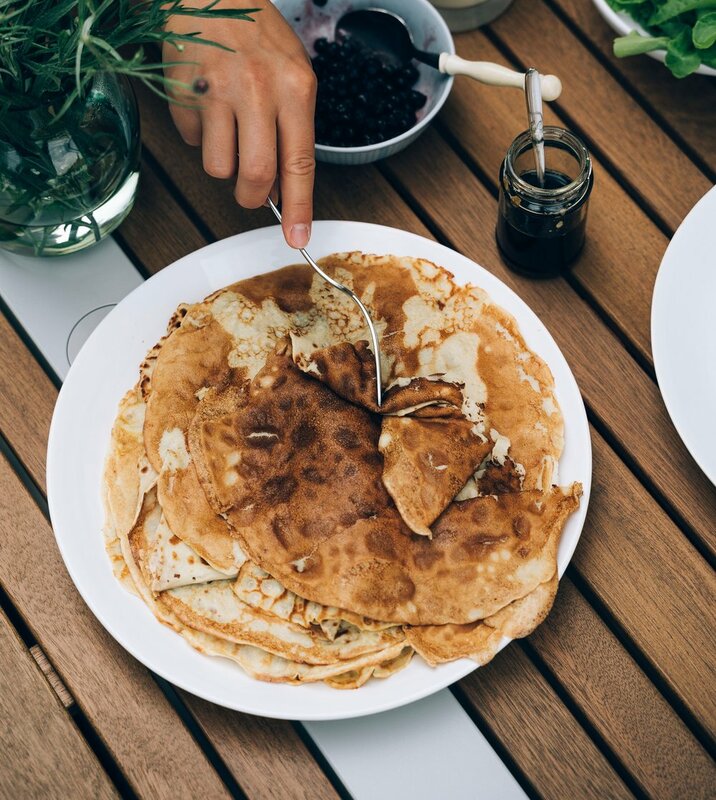 Swap high sugar, simple carbs such as muffins, pastries and commercial cereals for complex carbs such as wholegrain rye bread, quinoa or oat porridge, buckwheat pancakes. Complex carbohydrates are a source of fibre and B vitamins and they replenish liver glycogen stores after fasting overnight. 4. Include healthy fats such as nuts, seeds, avocado, fatty fish. Omega 3 oils support mood, has an anti-inflammatory effect in the body and helps us absorb fat-soluble nutrients and antioxidants. 5. Include vegetables. Before you turn up your nose at the thought of veggies for breakfast, how about poached eggs with garlicky mushrooms, roasted tomatoes and wilted spinach, smashed avocado and spring onions, feta and red pepper omelette? When my other children are reluctant to eat in the morning, this recipe is a firm favourite. Break eggs into a bowl and mix. Add the buckwheat flour and stir it in with a fork. You need to start adding to the milk to fully blend in the flour. Once all the lumps are gone, add the milk till you reach the consistency of single cream. Cook like normal pancakes. Serve with toppings of your choice such as dark chocolate (I melt it onto the pancake while I cook the second side or sugar free jam. I like the Whole Earth range. Or go savory - grated Manchego and fried mushroom is delicious.